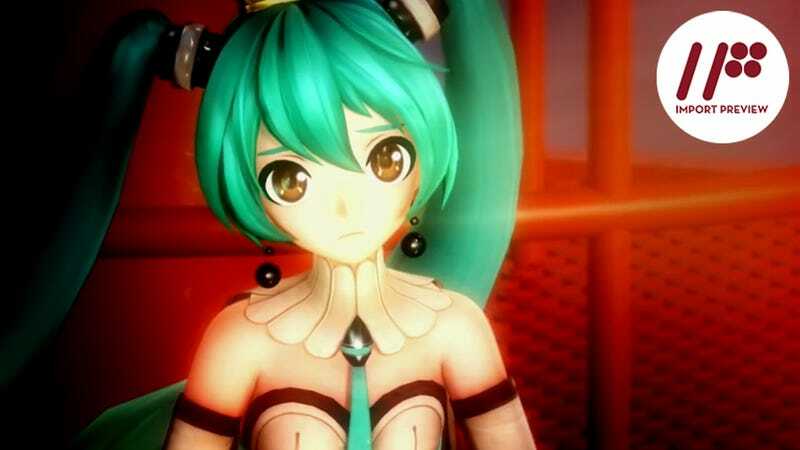 Project Diva X has a few things you wouldn’t expect in a Hatsune Miku game—like a bit plot and a nice helping of strategy. There’s not actually a lot to the plot. It’s mostly just a collection of short, unvoiced conversations between Miku and her friends that are often about one aspect or another of being an idol. They are cute, harmless, and largely forgettable—but a bit of loosely connected storyline, nonetheless. The game starts on the neutral gem. After the first four songs, a medley of classic Miku songs unlocks. Once you’ve beaten that, you can move on to filling one of the other gems. The Cute, Cool, Beauty, and Chaos areas have five songs and an unlockable medley apiece. There is one caveat though: Once you start on a gem, you can’t switch to a different unfilled one until the one you’re working on is filled. Which order is best to choose? Well, that’s up to the modules—i.e., costumes—you’ve unlocked in filling the neutral gem. Yes, indeed. Here’s where that nice helping of strategy begins to come into play. In Project Diva X, modules and accessories are far more than cosmetic. To start, each is linked to one of the five types of songs. When wearing a module or accessory that matches a particular type, you get a voltage bonus when doing that song—making it easier to beat. More than that, each module has some sort of special effect that affects gameplay. They can do anything from giving point bonuses for lengthy combos to increasing the odds of getting a rare module. Accessories, while not having special effects like the modules, give a small bonus to their associated type of song and can be combined in specific ways—e.g., rabbit’s ears paired with a rabbit’s tail—to get an additional voltage bonus. Unlike in past Project Diva games, the main way of unlocking modules and accessories is not in a store but during the songs themselves. Each song has a portion of the song in which a near-perfect performance will allow Miku (or her friends) to transform into a new module, with that module becoming yours permanently at the end of the song. Which module you unlock is random. However, each song has a rare drop module that only drops on that specific song. This is what makes Project Diva X so much more fun to play than past iterations of the series. In each song you must balance your skill versus the module you choose to use. Is the voltage bonus necessary or can you risk using a module with a great effect but of the wrong type? And beyond that, what are you trying to achieve? Do you want bonus points? Accessories? Rare modules? Modules you haven’t randomly gotten yet? Or gifts for the vocaloids that they’ll put in the menu room? This aspect likewise adds a ton of replay to the game. Didn’t get that rare module drop you wanted? Well try, try again. There are also occasional event quests—some of which have their own little stories and allow you to make your own medley out of the songs you’ve already beaten. Of course, if you just want to play the songs like in past games and not worry about all the new strategy aspects of the game, you can play that way also. Once you unlock a song in story mode, you can play it in free mode whenever you want. And it takes only a few hours to finish the story mode if you choose to blast through it. On the gameplay side, little has changed from Project Diva F 2nd. Shapes that correspond to the PlayStation controller buttons fly across the screen and when they line up with cookie cutter versions of themselves, you push the corresponding button. The only new feature is the occasional flying button that overstays its welcome (called “rush notes”) which you can press again and again for bonus points. The only possible downside I found with Project Diva X is the amount of music. While I greatly enjoyed the game’s song list, there are just 24 normal songs and 6 medleys. Project Diva F, for example, has 39 songs while Project Diva F 2nd has 40 (56 with DLC). However, when it comes down to it, Project Diva X marks the most fun I’ve had playing a Project Diva game. The plot, while light, is a nice little touch; but it’s the strategy decisions related to the modules and accessories that make the game a million times more addictive. Through them, the game gives you reason to replay the songs again and again. And let me assure you, while this import preview may be finished, my time with the game is not. Gotta collect ‘em all, right?